Last year, we translated all of the remaining texts for both Avalokiteshvara and Krodhikali (Tröma Nagmo, “Black Wrathful Lady,” a form of Vajrayogini) terma cycles. We have reviewed over a hundred hours of our meetings, revising and annotating our work, as well as preparing additional questions and translations of several new texts received. These include: (1) a complete ngöndro text for all of the Vidyadhara’s terma, compiled by Karma Senge Rinpoche and incorporating the liturgy discovered as terma by the Vidyadhara, along with Karma Senge Rinpoche’s commentary and practice instructions, (2) Karma Senge Rinpoche’s commentary on The Seven Vajra Verses terma, and (3) the abhisheka text for Krodhikali, never before seen by us. We are now planning to continue our work with Karma Senge Rinpoche. Our continuing contribution to The Precious Treasury of the Ocean of Dharma, the compilation of the Vidyadhara’s teachings at the Vajradhatu Seminaries, was completed this year with our review of the third and final volume on vajrayana. For this section, which is approximately double the size of each of the first two volumes (900 pages), we spent considerably more time checking the details for Judy Lief and her team, including much work on the Glossary. Our related project of translating the Vidyadhara’s notecards for Seminary talks continues, with the view of publishing these next year as an e-book and a DVD containing all thirteen years of his Seminary transcripts. We have finished digitally inputting all of the cards in a Tibetan font, which will be presented along with translations and facsimiles of the original cards in the Vidyadhara’s own handwriting. The Sakyong bestows the Kurukulla abhisheka in Boulder, Colorado. 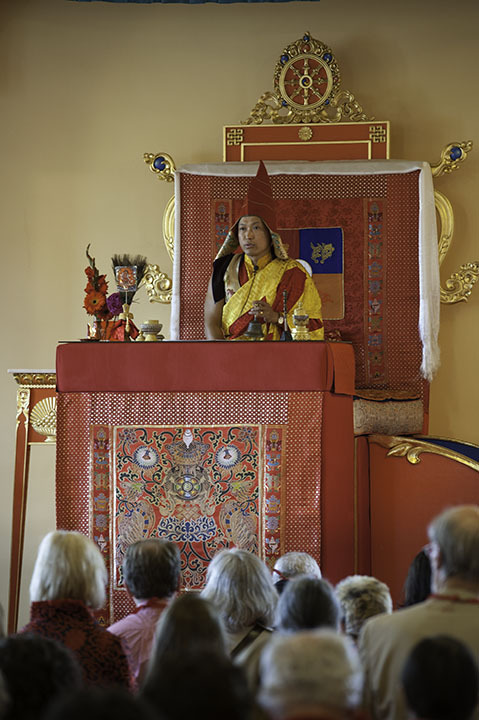 In June, Sakyong Mipham Rinpoche bestowed Jamyang Khyentse Wangpo’s Kurukulla terma empowerment from the Rinchen Terdzö at the Boulder Shambhala Center. The abhisheka introduced The Padmadakini Kurukulla: The Sadhana of Magnetizing, a practice composed by the Sakyong, which expands on a short Kurukulla sadhana authored by Jamgön Mipham Gyatso. The Sakyong chose this particular empowerment as an introduction to Kurukulla because of its profundity and because it is a yangter, or rediscovered terma, of Rongsom Pandita, the eleventh-century siddha who stands with Longchenpa and Mipham as one of the principal Nyingma teachers of the vajrayana view. The empowerment text and Tibetan sections of the practice text were translated by Patricia Blaine, assisted by her husband Walker Blaine, who was the lead teacher at the program in Boulder. The Sakyong bestows the Kurukulla Abhisheka. Kurukulla is a principal deity used in the activity of magnetizing, bringing people, energy, and wealth to the dharma. The role of this practice is comparable to that of The Heart of Siddhi, the Jambhala practice introduced by the Vidyadhara to sadhakas in 1984 for the practice of enriching. The Sakyong has asked leaders and Vajrayogini sadhakas with an interest in magnetizing to practice Kurukulla during the current period of growth in Shambhala. 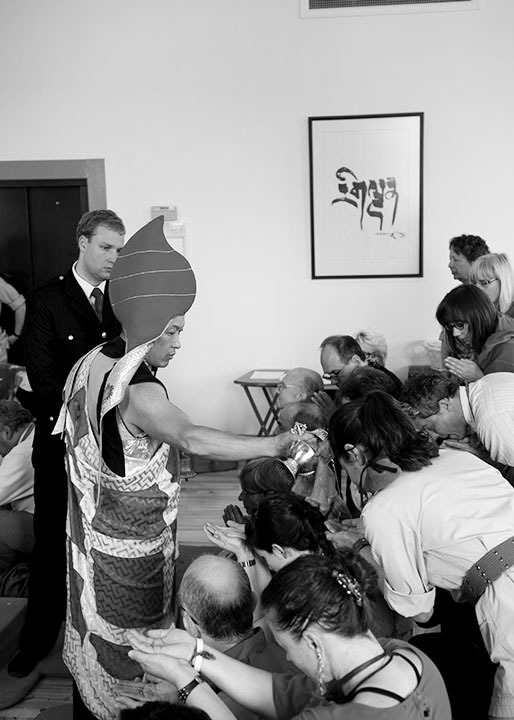 We look forward to the Sakyong bestowing the Kurukulla abhisheka in Nova Scotia in 2013. 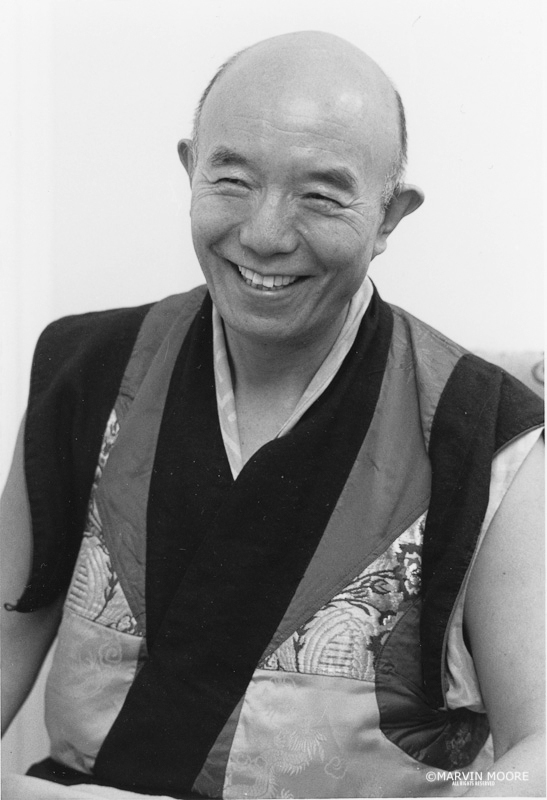 Venerable Tenga Rinpoche, meditation master of the Kagyü lineage and beloved teacher to so many, passed away this spring. Rinpoche was the main teacher to our sangha for the practices of Chakrasamvara and the Six Dharmas of Naropa, of which he was a master and provided detailed instructions to us over several decades. He was also the principal advisor and architect of The Great Stupa of Dharmakaya. A beautifully written and inspiring account of his parinirvana is available at: www.benchen.org/en/tenga-rinpoche/parinirvana.html. Other tributes to this great teacher can be found on the Chronicles at:www.chronicleproject.com/stories_352.html. The Committee has been participating in a global effort “84000: Translating the Words of the Buddha.” Scott, Jessie, Jaki Connaughton, and Ryan Jones, along with a team of apprentices from Scott’s class, have been translating The Great Drum Sutra, a mahayana sutra on tathagatagarbha (“buddha nature”). Scott, Jessie, Jaki Connaughton, and Ryan Jones, along with a team of apprentices from Scott’s class, have been translating The Great Drum Sutra. The Committee has applied for a grant from 84000 to support this work. 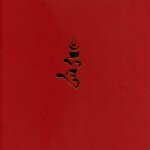 Please visit:www.84000.co, which includes a reading room where you can read translations of various sutras and tantras. 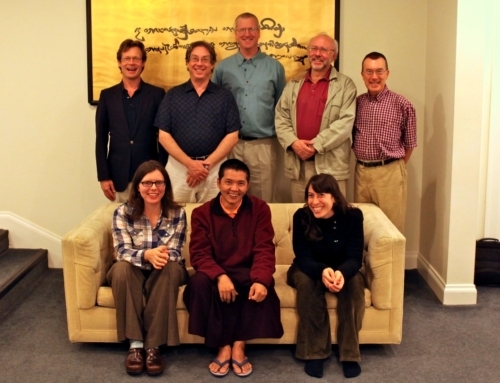 Meeting with Tsoknyi Rinpoche in Halifax, Summer 2012. At the beginning of the summer, we met with Tsoknyi Rinpoche during his long-awaited first visit to Halifax. We were able to ask him some of our questions on the Vidyadhara’s Seven Vajra Verses terma. He suggested that we request the assistance of Khenchen Namdrol Rinpoche, and he volunteered to help us with that personally, as he is one of Khen Rinpoche’s students. It was a wonderful initial meeting together, and we look forward to his return. School Children at Karma Senge Rinpoche’s New School. This October, we will meet with Gyetrul Jigme Rinpoche to review a variety of Gesar texts by Jamgön Mipham Gyatso. At the request of Karma Senge Rinpoche, the Committee is helping to bring awareness to and raise funds for both Wenchen Nunnery and Kyere Monastery, especially for the new school there. 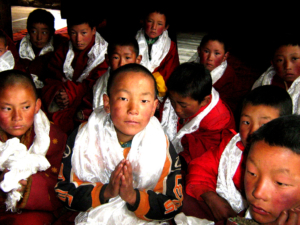 In this remote area where 200 children have not had access to an education, Karma Senge Rinpoche has already enrolled 120 children, and needs support so the remaining children can receive both a dharmic and academic education in Tibetan and Chinese. 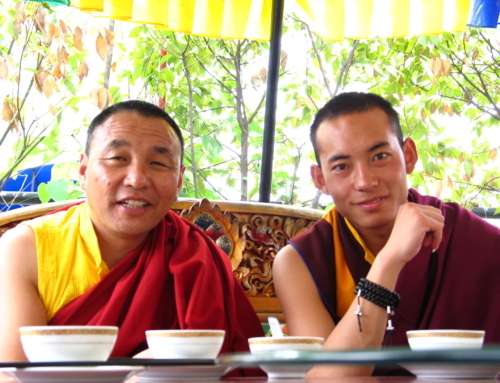 With the help of Gaye Carlson, who has done much of the outreach for Karma Senge Rinpoche, we have designed a new website for this endeavor:www.wenchen.org. 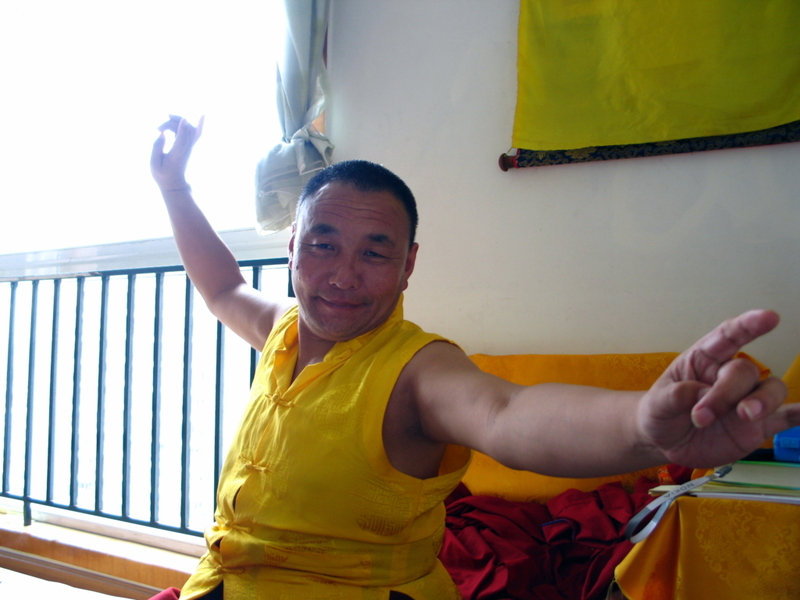 The site includes information on Wenchen’s history, its connection with Shambhala, updates on the school and building projects, a collection of photos and videos, and a place to make online donations. The Sadhana of Mahamudra: Resources for Study. A collection of articles and excerpts, mostly by the Vidyadhara, together with our more literal translation of the sadhana, expanded practice instructions, and an extensive new glossary. Bestowing the Supreme Wisdom of Great Bliss: A Feast Offering for the Ocean of Siddhas of the Ultimate Lineage, by H.H. Dilgo Khyentse Rinpoche; the feast-offering text and instructions, designed to insert within the sadhana text. The Sadhana of Mahamudra Abhisheka, by H.H. Dilgo Khyentse Rinpoche; does not include the feast offering, now published separately. The Sadhana of Mahamudra with Funeral Liturgy; an edition of the sadhana to be used at funerals, composed and arranged by the Vidyadhara. 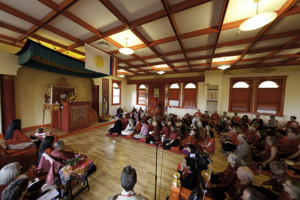 Talks on The Sadhana of Mahamudra, by Venerable Changling Rinpoche; vajrayana talks given in Halifax in 2010. 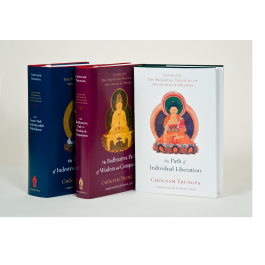 This coming year, we will also publish deluxe editions of The Sadhana of Mahamudra with color reproductions, as well as pocket editions. You can now order these texts directly online here. At the request of the Sakyong, we are compiling and publishing a Tibetan edition of the Daily Chants for practice at the Kalapa Court and for aspiring students of Tibetan. Our refinements and revisions to The Golden Dot: The Epic of the Lha are now underway again after a long hiatus. We will be republishing this in the same elegant design, with facing Tibetan and English text, as all the other Shambhala texts by the Vidyadhara. Look for this in the coming year. Larry gave several Shambhala Online presentations, mostly for Vajrayogini sadhakas. He met with the Avalokiteshvara practitioners and Vajrayogini sadhakas in Boulder last fall and this spring. Larry returned to Dorje Denma Ling to lead a 10-day Chakrasamvara retreat. At Gampo Abbey, he taught The Sadhana of Mahamudra for a week, and soon after provided the orientation for this abhisheka in Halifax. Larry and his wife Gina both attended the funeral ceremonies for the Venerable Tenga Rinpoche in Kathmandu, practicing with lamas and friends at Benchen. During his time in Nepal, Larry also met with a number of teachers and colleagues, including Khenpo Tsültrim Gyamtso Rinpoche and his students, Tulku Pema Wangyal and Jigme Khyentse Rinpoche, Druppön Khenpo Lhaibu, Tendzin Dorjee at Phullahari, and Rafael & Lee Ortet at Tsadra Foundation. Scott taught a course on the “Modes of Engagement of Mind,” a section of Khenpo Tsultrim Gyamtso Rinpoche’s Lorik, at Gampo Abbey’s shedra program in November. Over the holidays, he led a mahamudra program in Halifax, practicing with the 9th Karmapa Wangchuk Dorje’s Pointing Out the Dharmakaya. He attended a conference in Bangkok, with a group dedicated to compiling a “Buddhist Bible,” including selections from the Theravadin, mahayana, and vajrayana traditions. Under the auspices of the United Nations, the publication is scheduled for this coming Vaishakha Day. In July, Scott taught at Nitartha Institute in Bellingham, and gave a talk at the Bellingham Shambhala Center on three unique teachings of the Vidyadhara Trungpa Rinpoche. With Andy Karr, he continues to lead a weekly class in Halifax, devoted to contemplating the pith heart instructions of the Kagyü and Nyingma lineages. Mark continues to lead weekend Vajrayogini fire offerings at Dorje Denma Ling, focusing on enriching and magnetizing. He has also been giving dharma talks in Washington D.C. when he visits his children there, and has been teaching meditation in Halifax at the North End Meditation Space. Tingdzin taught the three guru yogas of Marpa, Milarepa, and Gampopa to the three-year retreatants at Söpa Chöling this September. Jessie, along with Dan Scott, has helped to initiate, manage, and teach at the new North End Meditation Space in Halifax. Patricia married fellow translator Walker Blaine, and they spent part of their honeymoon in Nepal where they visited Sakyong Mipham Rinpoche and Khenpo Tsultrim Gyamtso Rinpoche. Walker is continuing his work on a book about pilgrimage. He led a four-karmas fire offering in January, and a vajrayana intensive in August, at Dorje Denma Ling; and also facilitates an ongoing ngöndro discussion group in Halifax. David MacLellan, who has been our bookkeeper for several years now, has taken on additional responsibilities as our publishing assistant, helping with reprints and order fulfillment. 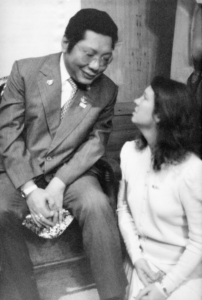 Trungpa Rinpoche and Polly Monner Wellenbach. Polly Monner Wellenbach, wife of Scott, passed away on August 14, at her home in Halifax. Polly was a beloved student and friend of Chögyam Trungpa Rinpoche. He called her the “Daughter of Karma Dzong.” She was the director of Karma Dzong in Boulder for many years, among the first settlers of Shambhala Mountain Center, and lived at the first Maitri Center in New York. She moved to Nova Scotia with Scott in 1986. As a loving friend and teacher, she was known for her kindness, humor, and wisdom. She was unwavering in her devotion to her guru and was instrumental in the development of many of his projects. We miss her deeply. To read or add to her tributes, please see:www.chronicleproject.com/stories_376.html.